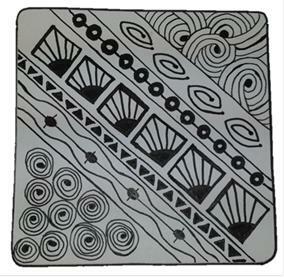 ZENTANGLE FUN at the October Workshop! Judy Rishel invites everyone to join her for an afternoon of Zen calm while learning the art of tangling. She explains her workshop as an "art form that has exploded because you don't have to be an artist to do it! I will share the classic form on a tile showing some designs that you build up one line at a time. 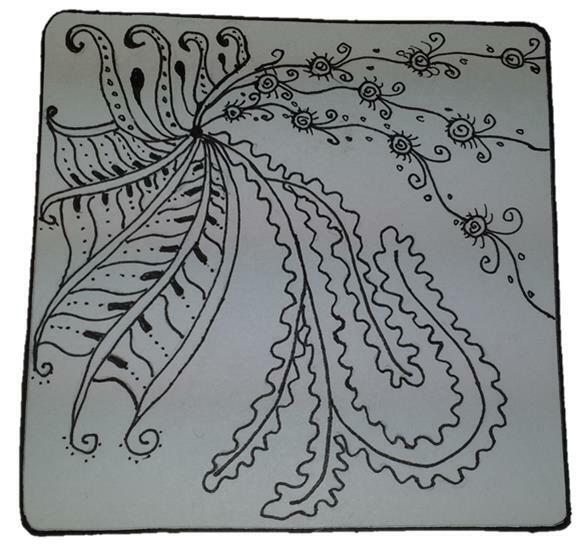 You will receive some handouts with more in-depth information about this method along with forms to build your own Zentangle pattern. In your kit will be other materials to tangle on like bookmarks, flowers, mandalas, a ready-made picture, and cards to make. 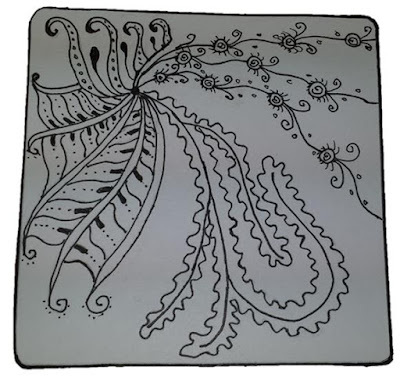 After some practice patterns you can explore on your own and 'play' with the many materials available like Zentangle pattern books, finished samples, string suggestions, letters, and stencils to use to draw your own Zentangle. Come and enjoy!" RSVP YES! by Oct. 8. At the September 12th workshop we had a second chance to make an exchange book from a previous theme or book structure that we missed making during the year. Or we could try something new. We had quite a collection of books including NORBAG 20th anniversary cards, different structures and alphabets. Dolores G. taught the workshop on double needle Coptic stitching. Since it is our twentieth anniversary, she brought book covers in the shape of candles and we had ten signatures to sew onto those book covers. The overall size of the book was approximately 2" x 2 1/4" (not counting the flame of the candle on the covers). It was a tiny little book. We started by folding ten signatures. Then Laura used a jig to make the sewing stations (only two holes for this tiny book). We stitched the first signature to the cover and then sewed on the other signatures. We used what is called a sewing station that consisted of two holes. We had one long thread with a needle at each end and sewed back and forth between the two holes. We all ended up with this little tiny book in any one of several colors. Dolores also showed us how to make larger books using the double needle Coptic stitch. In our little books, we used one station (consisting of two holes, a single strand of thread and two needles). In larger books like this one, she had 3 stations to sew simultaneously. We had about 20 people laughing and talking while working on our books. The current display in the Humboldt County Library kiosk celebrates NORBAG's 20th anniversary with books made by some of our charter members. In September 1995 Shereen LaPlantz gathered together 14 fellow book enthusiasts to form the North Redwoods Book Arts Guild. We currently have a membership of more than 180 with at least 60% living outside of Humboldt County. Of those original members, eight are still active today. One of Shereen's objectives was for the Guild to host a book arts conference the following June. To raise money for the conference, the group made a collaborative book that is pictured here and can be seen in the kiosk. The Guild's monthly book exchange started with the first official meeting (October 1995) and has been going on ever since. It is a wonderful way for our members (both local and out-of-town) to be inspired to make a book. It is purely voluntary with an average of 10 to 15 participants each month. The themes for the exchanges are voted upon by the membership and a blind draw determines whose book one receives in exchange. Members have also made books that have been in exhibits in art galleries and other venues. Although 20 years have passed since the first meeting, NORBAG's original goal still remains "to promote, encourage, and educate participants, as well as the general public, about book arts (traditional as well as non-traditional forms of bookbinding) and related arts." and Cover to Cover shown here. Thank you to the Humboldt County Library for allowing us to maintain the displays in this kiosk, Becky M for arranging the display, and Dolores G for providing the photographs used here. The first meeting of the North Redwoods Book Arts Guild was held in September 1995 and we even had a workshop that day! Fast forward 20 years and the Guild is alive and well. To celebrate, this month's workshop will be a simple Double Needle Coptic Bound Candle Book. You will have your choice of either a tweed or solid stitching pattern. The photos show the difference. The sewing technique is identical, just the choice of threads make the difference as seen in the photos. This is an example of tweed binding using two colors of thread. This example shows one color of thread for the binding. Note: This is a small book using only two needles. It will have 10 signatures measuring 2" x 2 1/2" so that by the end of the workshop, you should feel confident to later make a larger book using four or even six needles. RSVP is essential. PLEASE respond to Dolores no later than Tuesday September 8 so that all the materials can be cut and ready for you to sew. Piercing tool (absolutely necessary). If you do not have one, they are available at Ellis Art & Engineering. Ask for a "needle tool used for clay". A metal one is $3. and a wooden handle one is $1.20. RSVP YES! by Sept. 8 to Dolores. See the newsletter for her contact information. She will respond to all emails.